You’ve got to love the French. Despite our country’s love for all things that come in vending machines — e.g. newspapers, DVDs, soft drinks and the list goes on — only the French could have conceived using these convenient little boxes to pump wine! In order to reduce the amount of glass and cardboard used to bottle and box the delight, French wine enthusiast Astrid Terzian came up with the idea of selling wine by volume. 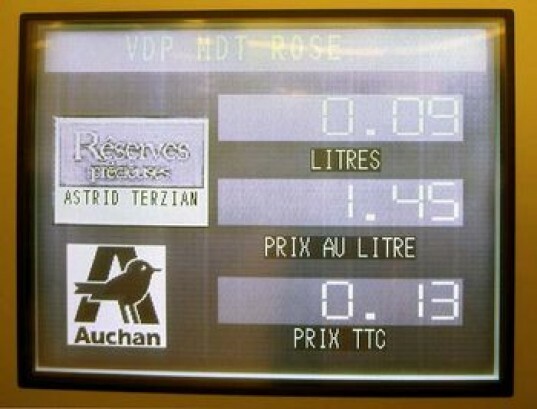 Dispensed through pumps in amounts of 500- and 1,000-liters at local French supermarkets, all that would be required of customers is a container to fill up and a handful of change! Terzian said that she started this scheme in 2008 as a way to tap into two themes that were at the forefront of the public’s concern: the environment and the economy. By getting customers to use their own containers, the wine pump allows for products that normally come with a high carbon price tag, to reduce their footprint as well as to cut down on material packaging. The reduction in mass also means that the wine can be shipped much more efficiently, better optimizing available space and reducing transportation costs. 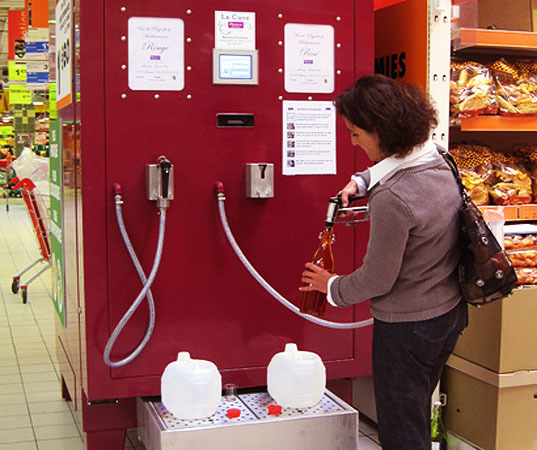 While there are only eight supermarkets in France that actively use the the wine-pumping scheme, the system is anticipated to make its way over to the US within a year. While the idea could raise eyebrows among more fastidious wine connoisseurs, for the more environmentally conscious, those who are looking to save some money on their next glass (it reportedly only costs $2 a litre) this is an ideal. On our drive up "the hill" (Mt Etna") to our villa in the early 80's. was a gas station, where we'd take our massive "olive jars" to fill-em up with wine. put the nozzle in the jar, fill as much with white and/or red, to the color of your choice. or, just fill it comepletely with one or the other. it was great for parties. glad to hear it's sorta coming to america! This may seem like a new idea but the Zero Waste Institute has for years analyzed Zero Waste principles and promoted the refilling of every kind of bottle and container as the only logical way of reusing containers. All containers CONTAIN! This is the function that needs to be reused, not the mere material of the container, the way the recyclers would have us do it. Let\'s not chuckle at the French as though this were some kind of cute French peculiarity. They are actually leading the way to a packaging revolution. Let\'s run with it. See and sign up at www.zerowasteinstitute.org for more info. hey Jarabito what are you some kind of snob or just an azzzz? My family has been drinking wine straight from the barrel for many generations. We are not alcoholics! We drink are bottles also, but for the most part in the house its all from the barrel. Actually the first comment reads the article correctly as it states \\\'Dispensed through pumps in amounts of 500- and 1,000-liters at local French supermarkets\\\' - the mistake is that it should read milliliters, not liters . . . It's not 500 to 1000 liters for the buyer, it's for the pump. It stores that amount inside. I do think this is ridiculous, good wine doesn't come perfect from the barrel, it takes some time in a bottle to finish aging. I guess this is good for alcoholics, not really minding the taste for the alcohol content, that or for cooking wine. Otherwise, I will keep on buying bottles. This is an awesome idea, when will it come to Australia? awinn233 I think you should re-read the article. It is delivered to the shop in 500 or 1000L containers, not to the customer. Surely you do not have to buy 500 or 1,000 liters of wine at a time! That is an absurd amount! You've got to love the French. Despite our country's love for all things that come in vending machines -- e.g. newspapers, DVDs, soft drinks and the list goes on -- only the French could have conceived using these convenient little boxes to pump wine! In order to reduce the amount of glass and cardboard used to bottle and box the delight, French wine enthusiast Astrid Terzian came up with the idea of selling wine by volume. Dispensed through pumps in amounts of 500- and 1,000-liters at local French supermarkets, all that would be required of customers is a container to fill up and a handful of change!